My custom Davidson ti BMX bike is pretty much all tack-welded together, meaning that the tubes are all fixed in place with a small bead of weld so that the frame can be handled. The next step is for the finish welding, where the weld is run completely around the circumference of each joint. The frame cannot be finished on the jig because the welder needs to move the frame about to access the surfaces. 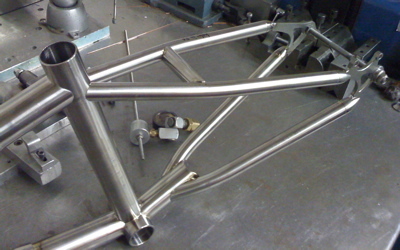 The sequence of joints to be welded has to be carefully planned, otherwise the alignment of the frame tubes will twist due to asymmetric shrinkage at the welds. In the photo above you can see the seat stays are now in place. The tubes on this bike are really stout, probably 2-3 levels of stiff beyond what I would have spec’ed on a regular road bike for my weight. As with most metal tubing, stiffness is determined by tube diameter and wall-thickness. The bike will be kinda portly for a titanium frame, but that was the trade-off I wanted in order to get a bomb-proof bike.